Good news at the weekend about my book ‘Speaking the Piano‘: it has been chosen as one of the Books of the Year by the Financial Times and by the Sunday Times. ‘Studded with gems of insight … a must-read for anyone who plays or loves the piano.’ (Sunday Times, 25 Nov 2018). 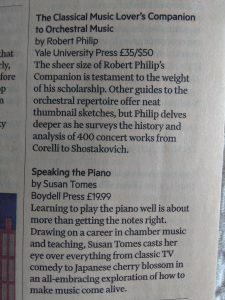 Even more thrillingly for our household, on the same day as my book was featured in the Financial Times, my husband’s book ‘The Classical Music Lover’s Companion to Orchestral Music‘ was chosen too. In fact, our books were next to one another on the page (see photo). When you write about classical music you get used to being told that it is a niche subject with a small readership, so it is delightful to be recognised by the mainstream press. Looking for Christmas present ideas for the music lover in your life? These books could be the answer. This entry was posted on Tuesday 27th November 2018 at 10:31am	and is filed under Books, Reviews. You can leave a response, or trackback from your own site. Thanks for recommending ‘The Lost Carving’ – it looks amazing and I can’t wait to start it!